The Zernikeborg will be an imposing building comprising three interconnected V-shaped wings, covered in aluminium tiles. On 25 November, the University of Groningen unveiled its design for the Zernikeborg, the new, impressive building for teaching and research in science & engineering. The new building endorses the University’s commitment to continue its work in important international research fields, such as chemical engineering, nanotechnology, materials research and astronomy. The Zernikeborg will be an imposing building comprising three interconnected V-shaped wings, covered in aluminium tiles. The building work will be carried out on the Zernike Campus Groningen in two phases between 2016 and 2022. Once it is completed, the Zernikeborg will replace the dated ‘Nijenborgh 4’ building. A 3D impression is available on the website. The Zernikeborg will be used for high-quality fundamental and applied research, serving as a base for top-class institutes such as the Engineering and Technology Institute Groningen, the Zernike Institute for Advanced Materials, the Stratingh Institute for Chemistry, the Groningen Biomolecular Sciences and Biotechnology Institute, the Van Swinderen Institute, the Kapteyn Astronomical Institute and SRON Netherlands Institute for Space Research. The sheer size of the building is impressive : it boasts more than 62,000 m2 of floor space, with a total length of 260 metres and a width of 63 metres, making it the biggest building on the Zernike Campus Groningen. The new building will be five stories high, with an extra floor for the enormous air conditioning installations. It will provide teaching and research facilities for some 1,000 Bachelor’s students and 450 Master’s students, and a workplace for 840 employees. The underground bike park has room for 1,000 bikes. In addition to numerous laboratories, the building also has rooms for practical lessons, a total of 450 fume cupboards, some 3 km of lab tables and 30 laser labs. A wide, attractive pedestrian route runs the entire length of the glass façades at the front of the building, connecting all the wings and giving a nice view of the campus. The ground and first floors form the ‘Plinth’, which will house the Research Cluster, the clean rooms, the atrium with access to the large lecture room, a conference room, seating, study stations and the restaurant with an outdoor terrace. The lively atrium is a large, covered area, suitable for exhibitions, conferences, study stations, and generally as a place to meet and take a break. The large lecture room has seating for 420 people, but can be partitioned into two rooms for 180 and 240 visitors. The core of the building on the ground floor will be home to the Research Cluster. It features vibration-proof laboratories that satisfy the VC-D, VC-E or VC-F criteria, with clean rooms in close proximity. The floors above accommodate the chemical, biochemical and physics laboratories and practical rooms. 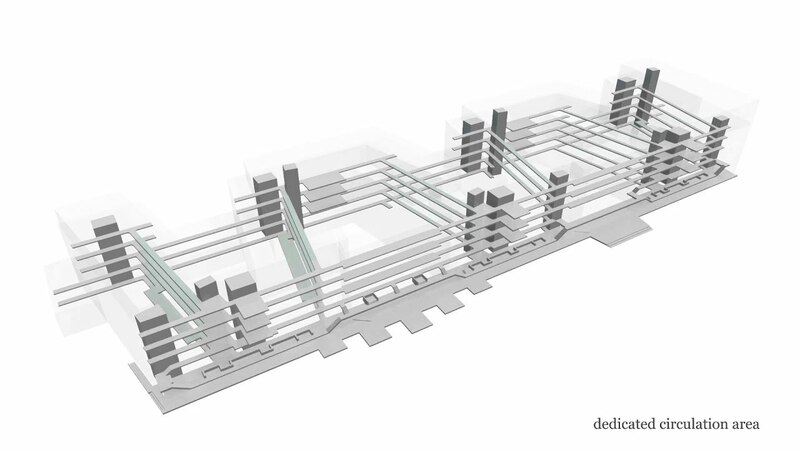 One of the special features of the Zernikeborg design principle is that all these different types of laboratories are flexible and interchangeable, as each one can be connected separately to the ventilation, power and gas supply networks through the shafts. Thanks to the zig-zag design of the building, all the laboratories can be built on the north side of each wing, keeping the impact of sunlight to a minimum. The Zernikeborg was designed on the basis of sustainable and earthquake-resistant design principles. Visible measures include the 900 m2 of solar panels on the roof. Saving energy was a priority, hence the fume cupboards with automatic doors, connection to two geothermal heating and cooling systems and the use of heat exchangers. The building has been made earthquake-resistant by making constructional modifications to the design and using lightweight materials, such as a plastic air-cushion roof over the atrium (instead of glass) and aluminium composite cladding on the façades. The next stage will be to design the exact layout and plans for the interior of the Zernikeborg. The technical design should be ready by mid-2016, after which the building and construction firms will be selected. The Zernikeborg will then be built in two phases, with the south side being built first (2017-2018). This includes the main entrance, large lecture room, atrium, clean rooms and part of the Research Cluster . Once these are finished, the first institutes will be able to move in and buildings 17 and 18 of Nijenborgh 4 will make way for the second building phase (2020-2021). The whole building project should be completed in 2022, by which time the older buildings will have been demolished. More information about the building process is available on www.rug.nl/fse/zernikeborg . Last modified: 03 November 2017 12.27 p.m.